When you follow us on twitter, you’ll receive up-to-date information on Latin America travel and unique Central and South America Gifts. Twitter is a miniblog focused on “in the minute” news, so by following Latin America Focus on Twitter, you’ll receive quick short updates on immediate travel issues or newly released products. Twitter also has the Retweet and Reply features. 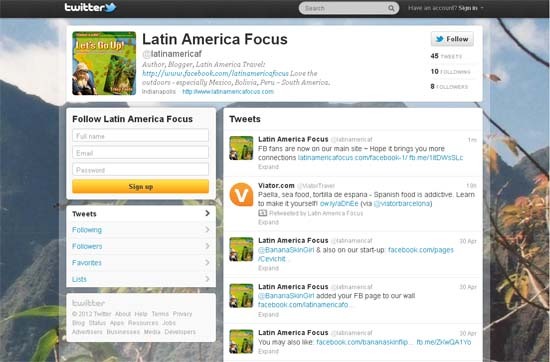 When Latin America Focus follows you, we can Retweet YOUR twitter posts to our audience. In addition, the Reply feature of twitter allows us to have short conversations with you. Twitter also uses the “#” symbol to track discussions. For example, if we tweet a post with #Bolivia in it, you can search twitter and join in our conversation. We post some, but not all blog posts to Twitter.